CLICK HERE and then click the red arrow button below the headline at the top of the page to listen to Sgt. Hagerty talk about the incident on NPR’s”It’s Only a Game” podcast. When it was announced that Muhammad Ali had died last week, it seemed as though everyone — not just those of us in the boxing world, not just those of us in the sports world — had a story they wanted to share about how Ali had meant something special to them. One story few had heard before, however, caught our attention. More than just a champion in the ring, Ali became a hero of the people, time and time again, for many reasons throughout his life. 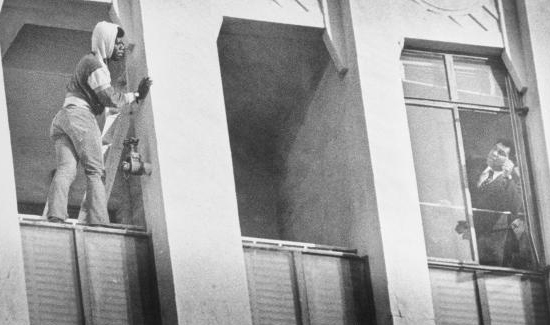 But in January of 1981, Ali’s heroics made all of the difference in saving a man’s life. Bruce Hagerty, then a police sergeant in the LAPD, was in command 35 years ago at the time crisis struck. He remembers Ali being there to help. Without him, things might have turned out differently.